You can coming also by car. In the case you would like to contact us by e-mail please complete our contact form, letting us know the service you are most interested in receiving. 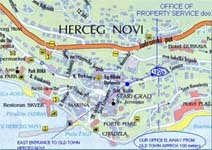 If you already have property in Boka Bay in Montenegro, indicate the type of property, (e.g. residence, apartment), size and location. Property Service team will soon possible contact you to determine level of interest and possible commencement of services.